There are few things in life that are as exciting as building your own home. The images & colors dance in your mind, until you can faintly see the outlines of a dream... your dream home! The only problem is transforming those dreams into reality. Wouldn't it be nice if you could sit down with a builder who would listen exclusively to your ideas and dreams, shape them, and create a masterpiece that would exceed your wildest expectations? We at Dream Custom Homes can! We offer ourselves as conduits to your dream home, by creating a world where you have access to an award winning builder. Access that fosters a relationship in which those dreams will become a reality. You will work side by side with the owners, Barry Burich who holds a Masters degree in Structural Engineering, Matt Burich who holds a Bachelors degree in the Arts, and in Citrus County, you will be working with Mark "Rusty" McDermott who has over 20 years of construction experience, and was awarded "Builder of the Year." Collectively, we will mold your dreams into a work of art that truly "withstand the test of time." So why don't you take a journey with us; for together we can truly build your Dream Custom Home! Best overall awards from Citrus County, Marion County and Hernando County. 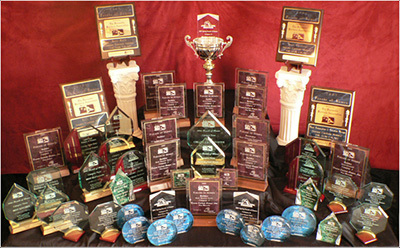 Dream Custom Homes is proud to have received over 80 major home building awards, including the Parade of Homes.